Hellshire Beach, just outside of Kingston, is famous for having some of the best fried ﬁsh on the island. Thatched-roofed huts line the beach and all you need to do is walk past one and smell the ﬁsh frying to get that hunger pang deep down in the pit of your belly. The ﬁsh is fried up fresh to order and served with festival or bammies, a cassava root (yuca) pancake, on the side. I took the inspiration from the beach for this recipe, using Jamaica’s beloved Red Stripe beer to make the batter for coating the ﬁsh. Since both the ﬁsh and festival are fried at high temperatures (which can dilute the potency of your cannabis-infused oil), the best way to introduce an herb component is through a dipping sauce. Chef’s note: Be sure to name someone a designated fryer if you’ll be partaking in the dish (or earlier courses) — you deﬁnitely don’t want to start daydreaming while your cooking oil is at 350°F! If you’re the cook at the party, wait to partake until the pot of oil is off the ﬁre. 1. Whisk together 2½ cups of the ﬂour, the cornmeal, baking powder, and salt in a medium bowl. Measure out ¾ cup of the mixture, transfer to another bowl, and stir in the remaining ½ cup ﬂour. Set this mixture aside for making the ﬁsh batter. 2. To the ﬂour mixture remaining in the ﬁrst bowl, whisk in the sugar. In a small bowl or measuring cup, combine &frac23; cup cool water, the melted butter, and vanilla. Add the wet ingredients to the ﬂour-sugar mixture, using a wooden spoon to stir until it comes together into a mass (add a tablespoon or two of water if the dough isn’t coming together). 3. Turn the dough out onto a lightly ﬂoured work surface and knead until it comes together in a semi-smooth ball, about 1 minute. Wrap it in plastic wrap and set it aside to rest for 10 minutes. 4. Unwrap the dough and sprinkle it with a little ﬂour. Divide the dough into 12 equal pieces and roll each into a 3- to 4-inch-long rope. Transfer to a plate, cover with plastic wrap, and set aside. 5. Heat the oil to 350°F in a large pot or Dutch oven over medium-high heat. Once the oil comes up to temperature, drop 4 to 5 pieces of festival into the oil and fry, turning often, until they are golden brown and cooked through, 6 to 8 minutes. Transfer to a wire rack and fry the remaining pieces. 6. Whisk the beer into the reserved bowl of ﬂour and cornmeal, stirring until smooth. Dredge the ﬁsh fillets on both sides in the plain ﬂour, then drop the ﬁsh into the batter to coat both sides, allowing the excess to drip back into the bowl. Immediately add to the hot oil, frying just a few pieces at a time and moving and turning them occasionally so they don’t stick together. Fry the ﬁsh until golden brown on both sides and cooked through, 8 to 10 minutes (I like to take out a piece and cut into it to make sure the ﬁsh is cooked through before taking out the other fillets). Transfer to a wire rack. Repeat with the remaining ﬁsh. 7. 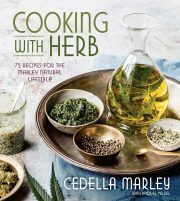 Stir the cannabis oil into the hot sauce and divide into 4 small dishes for dipping (one for each guest). Serve with lemons and limes on the side.